WOW!!! What a SPECIAL NEW Beanie Baby Halloween Cat!!! This cat is only available through the Internet & will not be sold in stores. This Beanie is mint with mint tags, tag protected, from a smoke free environment. Don't miss out on this Beanie Cat! Shipping with Delivery Confirmation-$5.00(slightly extra for International orders). I accept credit cards with PAYPAL, Money Orders & personal checks also. Most other Beanie Babies also available. I combine shipping with multiple items. SPEEDY SHIPPING! 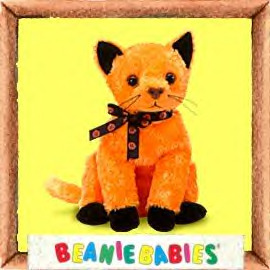 Items Similar To "SCARED-e Ty Beanie Baby Halloween Cat"